Make money Online: Yippee ! ! ! The next is from Trekpay ! ! ! My beloved readers ! This is getting so real... I wondered is it possible to earn money online. But now it is showing it's reality. Yes, I got my payment from Trekpay. Many of us would have heard about this site but those have not even know about this please read below. See my proof people. This PTC site has some special features mainly for people who are tired of waiting for the ad to load. First and foremost it has no timer to wait for the ad to load like other PTC sites. As we know that all paid-to-click sites have timer to view the ads. But this site has a feature called " T - Symbol". When we are viewing the ad page, anyone one ad page occasionally have this T - symbol. We need to click if we see that; otherwise, we will gain negative points and it may lead to account suspension. This site doesn't look cool but it pays. Most sites have a beautiful design but go scam soon. :)). Anyways, the next thing here is, we earn credits here daily not dollars. These credits are converted into dollars depending upon the profit that week. Yes, weekly once your credits are converted to cash. It may happen any day from tuesdays to thursdays. 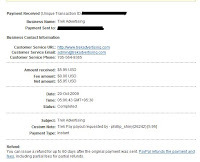 The minimum payout is $5.50 and don't worry, we can earn easily in a less period of time when compared to other sites. If you really interested in making money online, just click the banner below and register and start earning today. Be active, otherwise you don't earn anything. 4 comments to "Yippee ! ! ! The next is from Trekpay ! ! !" This sounds too good to be true...Is it? Hey! I've recently joined Trekpay and was just wondering how long it took you to reach payout? Hi, I just got paid from Trekpay today!